I have never been to Nantucket, but I know where I want to stay! The Nantucket, the island’s only luxury all-season destination resort which in January 2015 will unveil an entirely new wing of five Cottage Guest Suites. The new wing suites, designed by Kevin O’Brien, will have a glamorous yet breezy coastal living vibe- the inspiration is a classic and aspirational beach home but with a twist. The hotel is very geared up to wellness and will shortly launch The Art of Cabin Fever later this month until Spring 2015 – designed to bringing mind & body together through a cozy hunker down and hibernation program including everything from specially tailored massages in the boutique spa, mediation classes, daily yoga, heated outdoor hot tub with detox cocktails, healthy fondue by the outdoor fire pits, a fully stocked library in each room with specialist book recommendations, luxurious Marine Mer Sea bath experiences, an appointment with a nutritionist etc. It’s a unique take on the ever popular digital detox, perfect for guests to contemplate the year ahead and for mastering the art of mindfulness! Lastly Spring will see the launch of “Sea For Yourself”- a one-of-kind island hopping experience for guests between The Nantucket hotel and the sister island resort (same owners) on Martha’s Vineyard, Winnetu Oceanside – so guests can visit both properties and islands within the one trip. This week is the famous island Christmas Stroll (Dec 4-7). With it’s seasonal fall and winter activities, off season is the ideal time to visit Nantucket free from the crowds and at a great price – discounted rates start at $175/night on weekdays and $350/night on weekends. While the exterior is classic Nantucket 1891, the nautical chic interiors feature all the modern conveniences to enjoy breezy coastal living. Catering to its youngest spa go-ers, El Conquistador, A Waldorf Astoria Resort and Las Casitas Village, A Waldorf Astoria Resort, both in Puerto Rico, introduce “Ki’ Spa,” a kids spa program designed specifically for children featuring signature spa offerings and new kid-friendly products. Derived from the Taino word meaning “Earth Spirit,” the Ki’ spa program introduces children to healthy living practices, while pampering them with the freshest products and local ingredients. My Time! – A 25-minute signature massage using a special blend of massage oil containing coconut oil, avocado oil, and Vitamin E. The massage focuses on the back, neck and shoulders to help relax the body. Afterwards, children are treated to a 25-minute signature facial using Eminence Organic Skin Care. I Am Glowing! – A mini-version of the resort’s most popular Tropical Spa Ritual – the Coconut Sugar Scrub, featuring a sweet sugar scrub with cold pressed coconut oil to buff and polish the skin’s surface. Followed by a 25-minute signature massage using the resort’s very own blend of massage oil containing coconut oil, avocado oil, and Vitamin E.
Mommy or Daddy & Me Luxury Time! – Parents can share the fun experience of the spa with their children by selecting from the ‘My Time!’ or ‘Am Glowing!’ packages above to be enjoyed together at the same time in the same suite. In addition to new spa offerings, Ki’ Spa presents two new kids collections of spa products –Essence for Life Kids and Tai Kids. With products such as “Triple Chocolate Layer Soap,” “Banana Massage Lotion,” and “Orange Swirl Massage Oil,” children can pamper themselves to products designed to treat common skin conditions, such as dry patches and boo-boos as well as allergies and colds. They can also select from aromatherapy roll ons, which are ideal for daily use before bed, and before or after school. The start of Wimbledon this month is sure to see many tune in to see fellow Brit Andy Murray try to retain his coveted 2013 Championship title after becoming the first British man to win the tournament in 77 years. The Wimbledon Championship, held annually at the All England Club in London since 1877, is the world’s oldest tennis tournament and widely considered the most prestigious. It is one of four Grand Slam tennis events, along with the Australian, French and US Open, and is the only Major still played on grass, the game’s original surface. The tournament is a highlight in the British sporting calendar. Every year the nation embraces the Wimbledon spirit, whether it’s queuing for hours to get a ticket for ‘Henman Hill’, eating strawberries and cream or dusting off rackets and hitting some balls in the park. Whether it’s a week’s private tuition, the chance to go head to head in tournaments, or to simply enjoy a few friendly games in the sun, venture further than a local tennis club this summer and book a holiday inspired by its tennis. The new sports complex near to the Sani Beach Hotel features six floodlit clay courts and qualified tennis instructors who offer professional coaching for groups and individuals, as well as organising guest tournaments and equipment hire. There is the option to buy partner courses or family packages and for children there is a teen programme and a kids camp. The five star Sani Beach Club. The price starts from £1,579 per family of three. The offer includes a complimentary upgrade to full board, an exclusive free child place and seven nights in a Garden View Bungalow, based on a departure date of 20 October 2014. Price includes return flights from London Gatwick with Easyjet, airport lounge access and private resort transfers. The Sheraton Algarve Hotel is home to the Pine Cliffs Tennis Academy which features five floodlit courts located in beautifully landscaped grounds of the hotel. The Academy is run by a team of qualified tennis professionals who can arrange matches for solo players as well as clinics for guests of all ages and skill levels. All players are offered a free consultation on the right equipment for their style of play and stringing services are available. Sovereign is offering a saving of up to £483 on a holiday for two to the five star Sheraton Algarve Hotel. The price starts from £999 per person for seven B&B in a Deluxe Room, based on July 9th departures, and includes a complimentary bottle of sparkling wine and chocolate coated strawberries and an exclusive 20% accommodation discount, return flights from Manchester with Monarch, airport lounge access and private resort transfers. This five star luxury hotel features four floodlit tennis courts which can be reserved for guests by the hour. The hotel also offers professional tennis courses for adults and children for those who fancy working on their serve. Sovereign is offering a saving of over £330 and a complimentary upgrade to half board on a holiday for two to the five star Hotel Jardin Tecina. The price starts from just £895 per person for seven nights, based on a departure date of 14 September 2014 and includes ferry transfers from Tenerife, return flights from Birmingham with Thomson, airport lounge access and private resort transfers. Malia is one of the most popular destinations in Crete, and this charming town is situated at the base of Mount Selena. Malia holidays are all about having fun and partying in a beach setting. This part of the world is blessed with endless sunny days, perfect for summertime. Sun worshippers will find plenty of stunning beaches to choose from in Malia. The main beach is very close to the heart of the town, while several high end hotels and resorts also line the golden sand. Sun Beach is another popular stretch of sand that features plenty of amenities including a children’s pool. Other gorgeous stretches of sand in and around Malia include Potamos Beach and Tropical Beach. Malia boasts a large number of interesting historical attractions that are just waiting to be discovered. The historical church of Agioi Pantes is set on and islet near the town and can be reached by boat from Malia’s main beach. Visiting this charming church is an experience that should not be missed, while the boat trip offers visitors the opportunity to see Malia in a different way. The town also features a large archaeological site, which is situated near Potamos Beach. This ancient site features several collections of ancient artefacts as well as displays that offer an insight into the area’s rich history and culture. Old Town is packed with buildings that date back several centuries and wandering along the narrow lanes that wind their way through Old Town is an enchanting experience. Visitors who really want to let their hair down after dark will find plenty of places to play in Malia. Traditional tavernas are great places to warm up at the start of the evening before heading to Dimokratias Street. This vibrant street is malia’s main nightlife hub and visitors will find a large selection of different types of venues here from trendy cafes to local bars, restaurants and nightclubs. Of course, this is just a small selection of what Malia has to offer. The setting here is extremely romantic, which makes Malia a popular destination among couples on their honeymoon. The area boasts several luxurious resorts where visitors can unwind in style. Looking for new spa experiences in your travels? Resorts are getting more creative and offering unique new spa menu items to promote healing, personal growth, relaxation, balance and even life challenges. From New York to Thailand, here are 5 unexpected spa treatments that will keep you wanting more than a massage or facial. The long and frigid winter has begun to weigh on our minds and bodies as we wait for Spring. Rise out of this seasonal blue spirit with energy healer Diane Goldner at Cornelia Spa at The Surrey. Goldner is part of the spa’s innovative Experts in Residence Program, bringing celebrated experts in varying field into the spa in early April. A master in her field and handpicked by Cornelia Spa, Goldner brings exclusive New York access to her highly regarded services to address issues associated with insomnia, chronic illness and life challenges which are commonly flared up during the colder seasons. Together with the guest, the healer will set an intention for healing and gently run healing energy into the body. Guests also have the option to add-on a Cornelia treatment to extend the healing experience with Goldner. 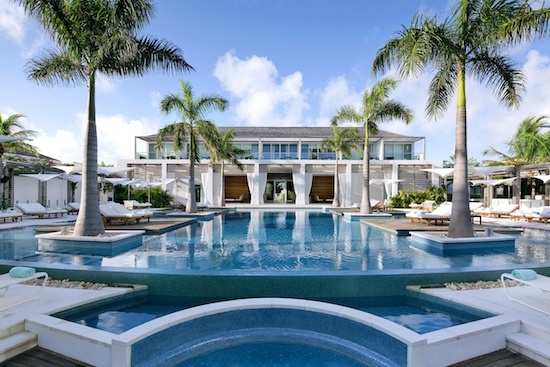 Regent Palms Turks & Caicos is home to an award winning Spa at Regent Palms, named World’s Best several years in a row, with 18 treatment bungalows and innovative East meets West inspired treatments. For spring, Regent Palms unveiled its new Bath Room. This never-before-used-room features a deep soaking tub with mood music and lighting that rhythmically dances alongside the music for a meditative experience. One new treatment in the Bath Room is the Detox Seaweed Leaf Bath: This seaweed bath utilizes organic hand-harvested seaweed by Voya to moisturize the skin, increase circulation and promote healing. In May 2014, L’Auberge de Sedona will be debuting L’Apothecary at the spa, a place for guests and Arizona visitors to draw upon the destination’s rich bounty of healing botanicals and fragrant herbs and flowers. L’Apothecary will offer the ingredients and supplies for guests to concoct and design their own bath salts, body scrubs, oils and masques with an abundant offering of elements found in Sedona, including rosemary, clay, piñon pine, juniper and more. The Dehp ® Enrichment Spa Experience at Alvadora Spa is a unique spa treatment, which unlocks your bodies, own innate intelligence to process and integrate stored experiences, promotes a sense of deep well being, and assists you in your personal growth and development. The session is delivered in a luxury spa room/suite which includes the Dehp ® integrative technique, balancing massage and essential oils. The Dehp® Experience brings relaxation to a whole new level, allowing guests to reflect upon their experience in a luxury spa room/suite following their treatment, and will leave them will a sense of clarity and balance. Reiki & Energy Healing – By combining the universal energy of Reiki Healing together with the intuitive skills and direct methods of energy healing, Nikorn channels a powerful healing effect into the energy bodies of your being. No discussion of symptoms or ailments is needed as the Reiki energy naturally flows to where it is needed, activating the body’s innate ability to self-heal. Through the simply laying-on of hands, Reiki Energy Healing will help to harmonize body, mind and spirit and is a powerful tool to allow our bodies time to tune in, relax and heal, leaving you with feelings of profound peace and well-being. Meditation and Mind Detox – Nikorn will share his knowledge and experience of this secret which has existed for over 2,500 years from the foundation of Buddhism. With exercises and techniques which are applicable to everyone, from any religion and any cultural background, Nikorn will help you to go within in order to find ultimate truth and clarity. “Fix Me” – Simply tell Nikorn how are you feeling and he will do the rest by combining all the therapies and tools he has learned over the years: meditation, reiki, energy healing, affirmations, visualization and self-help techniques. A change of scenery always inspires and motivates! Spinning seems more fun when it’s held in a glass tree house with views of the Caribbean Ocean. A quick getaway to Saint Lucia, Turks + Caicos, Puerto Rico or Aruba can offer a refreshing break to help reset your fitness and dietary behavior to get your body fit. Four Caribbean properties have the programming, atmosphere and scenery to help you get in shape for summer. Check out 4 Caribbean fitness getaways. Get back in shape before swim suit season at The BodyHoliday, Saint Lucia’s all-inclusive premier health and wellness resort. The property gives guests the opportunity to create their own customized fitness itinerary – whether you want to try the “Lose It, Tone It” program, the “Beat the Bloat” program, or simply partake in the unique daily fitness activities, including Spoga (Spin + Yoga) at the new sky-high Tree House spin studio. The resort is also offering unique upcoming fitness retreats, including Jive June, the resort’s dance-a-thon inspired program, and Well Fit Families, a week-long family beach bootcamp designed to challenge and bond families. Take your pick of refreshing fitness classes from spinning to Pilates at La Concha Resort, San Juan’s quintessential beach hotel. With the recent launch of its Signature Wellness programs created and directed by renowned fitness expert, Ana Paula Azirovic, guests now have access to classes, team building exercises, personal training sessions and meditation instruction. Ana Paula works directly with business and leisure travelers alike to book appointments and tailor experiences for individual and group travelers. Located on 12 acres of magnificent beachfront property on Aruba’s world-renowned Palm Beach, Hyatt Regency Aruba Resort & Casino is the ideal destination for vacationers looking to stay fit. Guests can take advantage of activities offered by Aruba’s premier watersports company, Red Sail Sports, located on property. Options like windsurfing and kiteboarding provide full body workouts–especially challenging the core and arms for balance and control– with twice the fun. For those preferring to stay dry, the boardwalk that runs along Palm Beach is a perfect running path with beautiful ocean views. Plus, guests have 24 hour access to the Hyatt Aruba’s indoor fitness center with treadmills, bikes, and resistance training equipment. Following a workout, guests can treat themselves to rejuvenating spa treatments at the hotel’s ZoiA Spa.